I LOVE party books. I don't own very many but I have a looong list of ones I'd love to have. Our book shelf is currently full of my husband's books. Sci-Fi, movie, and bio's. Not nearly as FUN as party books. 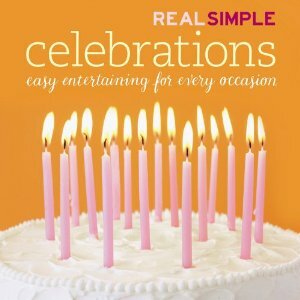 Real Simple Celebrations was the first party book I bought. The parties in this book are more... adult, than the parties I like to throw. I like A LOT more decorations than what's shown in this book. There are some great ideas that will inspire you and good recipes too. 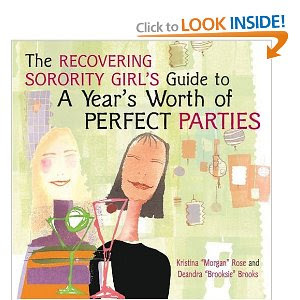 The book shows you everything you need for a party from the invitations to the decorations and food selections. 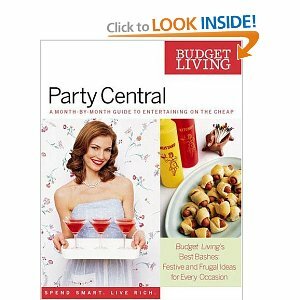 Party Central-A Month by Month Guide to Entertaining on the Cheap . Love this book. It's a fun, retro, call the gang over for a party book. I'm talking cocktail monkey's, pigs in a blanket, Twister and fondue kinda fun. Now these are my kinda parties. Let me know if you pick up any of these book and what you think of them.